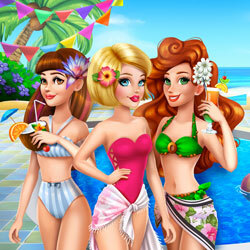 Description: It's a beautiful summer day, and it's time to go to the pool with Audrey, Jessie and Victoria! First, decorate the pool area and then dress up your favorite girl. The other two will then join the party as well, displaying their own choices for fashionable swimsuits and cover-ups.